The Lapwing is a wading bird, which means they have long legs and walk around in the water searching for food. They are mainly found at coastal marshes, farmlands, lakes and low moorland. You can spot flocks of Lapwings near coastal areas during the winter. When they chicks hatch from the eggs, they are able to run within a few moments. Lapwings are common in Europe and are also found in Asia. What does a Lapwing look like? 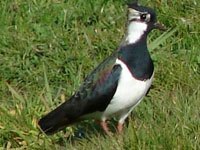 Lapwings are pigeon-sized birds with black and white colors. They have wide rounded wings, a white face and short pink legs. They have a long wispy crest that extends from the back of the head, turning up at the end. Where does the Lapwing live? Lapwings are found in Europe and Asia. They are found at open seas, shorelines and flooded areas. Lapwings especially like farmlands and open grasslands. 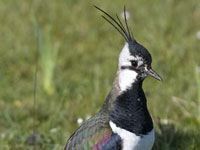 Lapwing nests are created with stems and leaves and are created in quiet areas in the grasslands. What does a Lapwing eat? 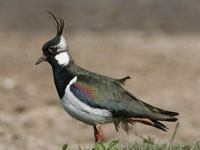 Lapwings eat a variety of animals and plants, such as worms, beetles, larvae, spiders, insects, caterpillars and seeds. They mainly feed at night to avoid attacks by gulls. Lapwings are very opportunistic birds so they will take advantage of freshly ploughed fields, which makes the farmers happy, since the Lapwings eat the insects that can be harmful to the farmer's crops. 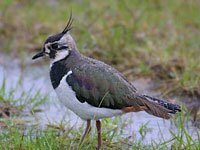 Did you know about these Lapwing facts? 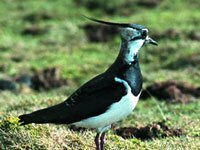 The common name 'lapwing' is thought to come from the Old English word 'hleapewince' which means leaping with a wink in it. The lapwing is also known as the green plover. 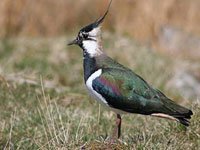 The old country name for lapwings is the peewit because of the sound they make. Lapwings like to nest on the ground in an open area. Download free Lapwing wallpapers, click on the image to open the large version. Print free Lapwing coloring pages, click on the image to open the large version.